Le systeme D, c'est le numero 1 du bricolage. Alors, mon " siamese cootie" est certainement du bricolage. I thought, i will start in french, because i want to name my siamese cootie LE SYSTEME D ! The left one has a nail file and on the right there is a peeler knife. 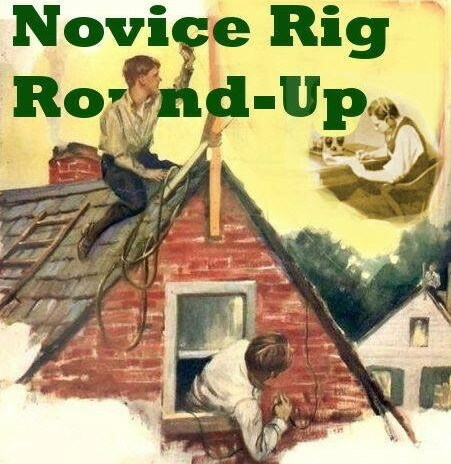 So, there will allways be a cootie in standby and, in case of a mishap in de middle of a qso, there will be help at hand. Hope you like my SYSTEME D es folks : keep BRICOLER. Be carefull with TT peeler knife. IT van sound vy different, when u cut yourself hi.. Yes here also in tandem in case my nuts come loose. On the right the prototype of Remy PA3AGF PLL Nr.436. In piano playing sometimes one needs 4 hands, a quatre mains ! Well the latest cootie that i made requires 2 hands to play. Hence the name 2HANDS cootie or cootie a 2MAINS. It has inbuilt shock absorbers ( hi trois fois ! ) cos the upwrights, with the contactpoints, give way ever so slightly on impact and by this they absorve the hits. 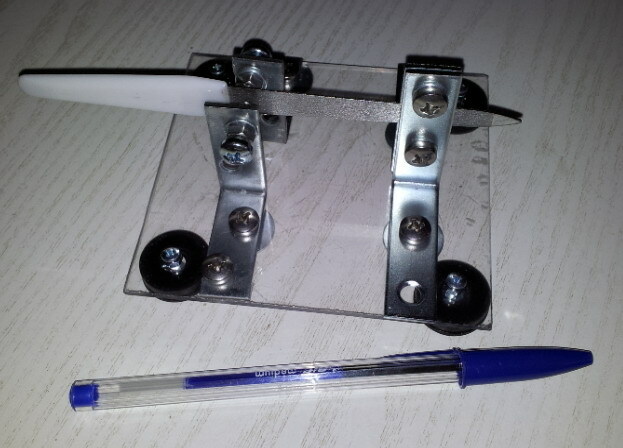 The lever is a nail file ( Martin G4ZXN told me abt this method ). So i was keen to try that aswell. Hpe to work you with this key. This smartphone of mine, besides beeing smart, has a mind of his own. Sometimes he doesn't do what i told him to do. Built with left overs, i present you the Red Devil cootie. It's named after our national football team here in Belgium ( The Red Devils ), because, like them, it has a nimble and smooth action. And also like them, it's capable of great feats, but, like them, prone to have a hickup now and then ( bad contacts ). In boxing therms, it's a bantam-weight cootie. This is a simple, universal and versatile cootie. I am planning to use it as a testbank. Simple,because, once all the parts were gathered, it took me just half an hour to assemble it. Universal, all manner of things can be used. 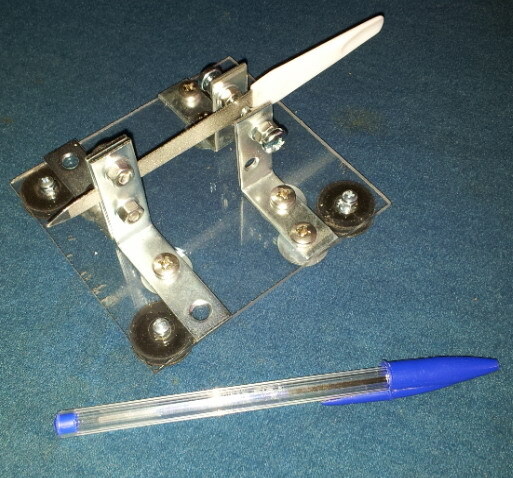 Hack saw blade, nail file, steel ruler for the lever and plexiglass, wood for the base. Versatile, because there are three sub-assemblies, who can slide along the base. 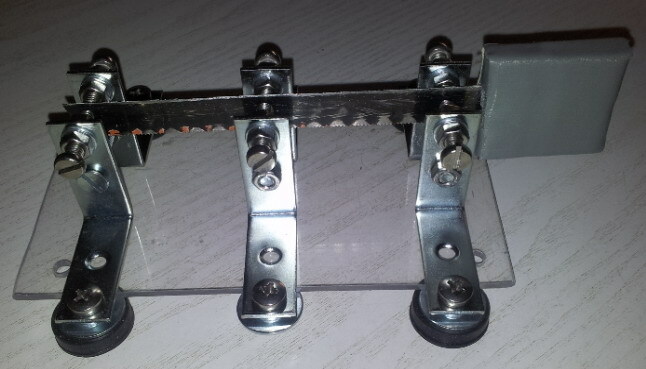 The left one holds the end of the blade and when you move it, the lenght between the fingerpads and the contact-points changes. 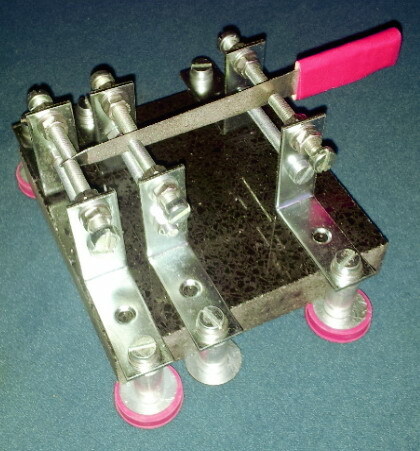 The middle one is the clamping-post and by moving that one, the lenght between it and the contact-points is altered. The third one, at the right, doesn't have to move and holds the contact-points. Hope you all like my "Half an hour" cootie. i have made some simplifications. All three sub-assemblies are identical now. This makes the choice off materials easier and bigger. Also, the rubber feet are attached now to these sub-assemblies and therefore there is no need anymore for drilling wholes in the base. 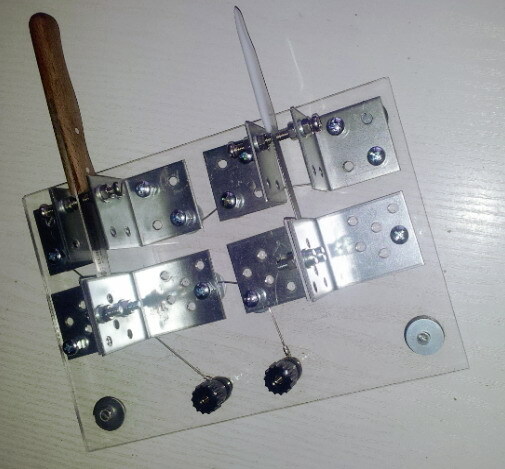 In case you are wondering how it is made, here attached a picture off one of the sub-assemblies. by popular demand ( hi trois fois) , Lou de VK5EEE has asked for more information, i will try to give you the information. Well this is a photo-shoot ( 4 of them ) that , hopefully, will give this info. 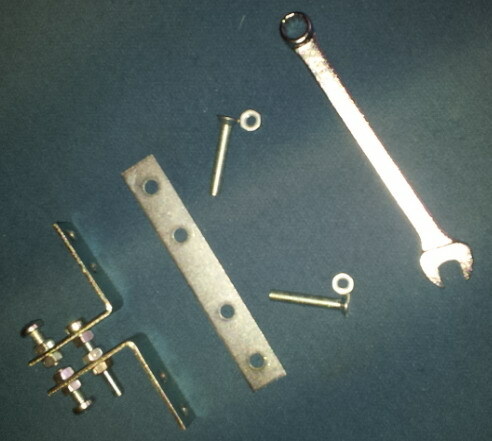 the parts needed for 1 sub-assembly. 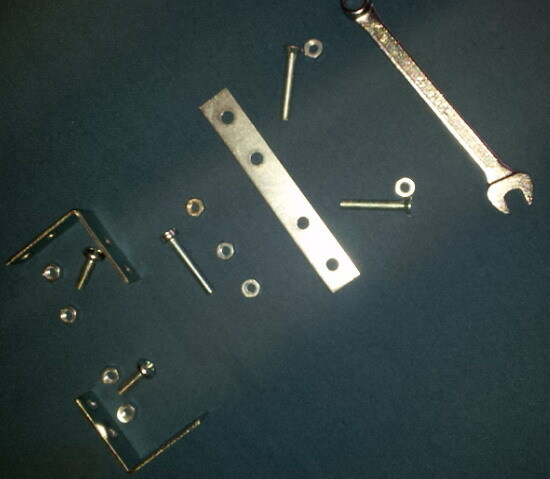 2 brackets, 1 connection plate, 9 nuts and 5 bolts ( various sizes ). Remember, you have to build 3 of them. insert in both brackets ( in the top hole ) a bolt using 2 nuts. Later on these will have to be adjusted to clamp the lever and or provide the contactpoints. 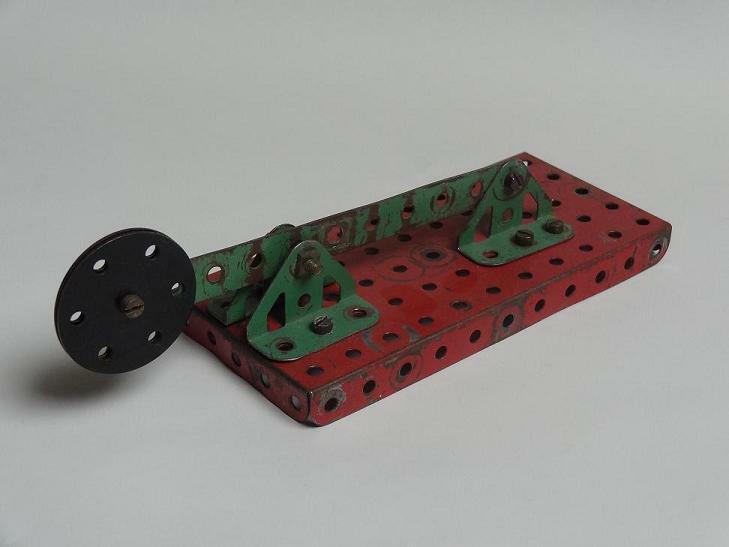 connect the 2 brackets together with a large bolt and 3 nuts. 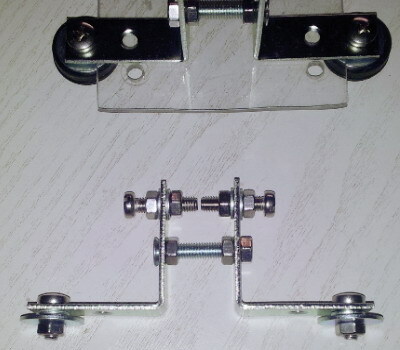 Make shure that the brackets are level and adjust and tighten the nuts so that the outer holes of the brackets coinside with the two outer holes of the connection plate. 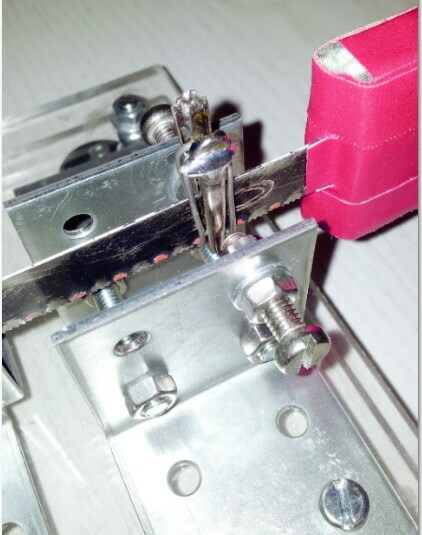 connect the brackets to the connection plate with 2 bolts and 2 nuts. 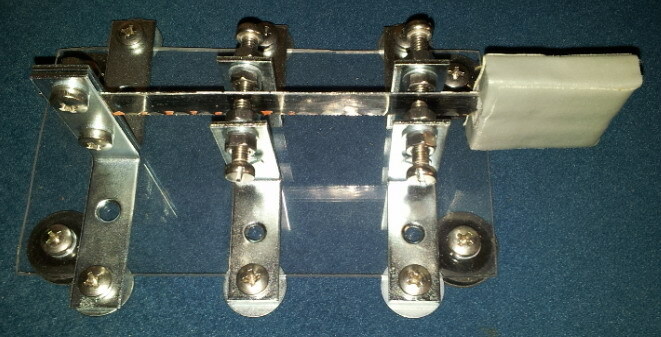 By doing so, we have created a slot where the choosen base can slide in. Place the sub-assembly in the correct spot and tighten the nuts. 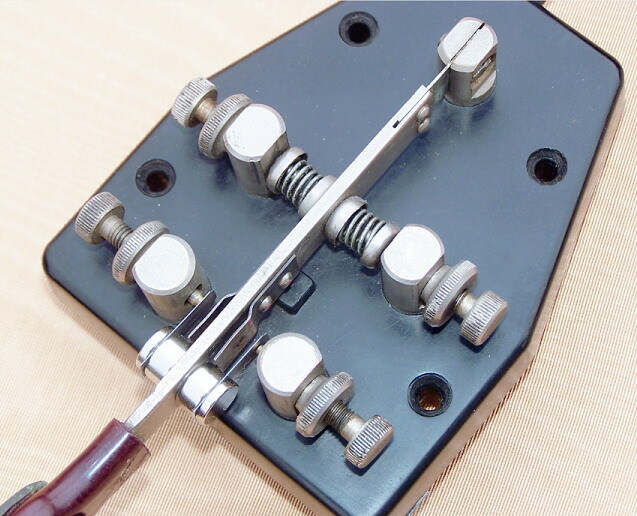 Do this 3 times and clamp the choosen lever with two sub-assemblies ( an outer one and the middle one ). The third sub-assembly will have to have a gap ( 2 a 3 millimeters ) for the contact-points. 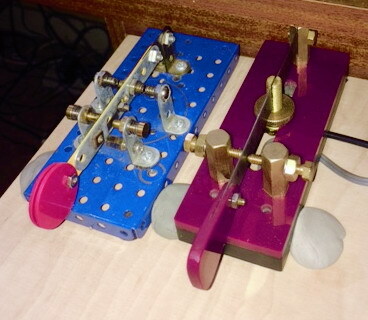 Now it is just a question of altering the lenght of the lever between the middle clamping-post and the contact-points, aswell as the lenght between the contact-points and fingerpads. You do this until you hit the jackpot, the sweet point, where it feels OOOKEEE ! I am shure you will then have a cootie, that will be your companion for longer than HAH ( half an hour ). PS : if there are spelling faults ( and i am shure there are ) this is entirely my responsability, hi trois fois. Anti BAD CONTACTS gimmick can be done with this. Place a croco-clip on the blade at the point were the contacts hit the blade. Now you have, on both sides, a perfectly good contactpoint, if only the clip would stay put.
. solder a thick wire, at the top, to 1 of the halves of the clip.
. take the wire down alongside the clip and underneath the bottom of the blade.
. bring it up alongside the clip.
. at the top cross over, between the 2 halves, to the other side of the clip.
. take the wire down again and under the blade.
. up again alongside the clip.
. and solder the wire to the second half of the clip. This keeps the clip firmly in its place. It provides far better contacts than the blade ever can do. This time a Red Devil in disguise, because this cootie has the same dimensions as that little nimble cootie and therefore it has the same lovely action. But the base is a black stone ( 10 by 10 by 2 cm ). It is built with te HAH ( half an hour ) method and with a pinch of magic. It has become a stationary devil, without any movement. It has, it seems, an inbuilt cruise control and at 17/18 wpm, instead of you steering the cootie, it engages the control and takes you along in a smooth and effortless CW. If that isn't MAGIC ! BTW, if hole drilling is one of your favorite hobbies, this isn't the cootie for you. 73 de ON4ADI Paul, es happy side-swiping. 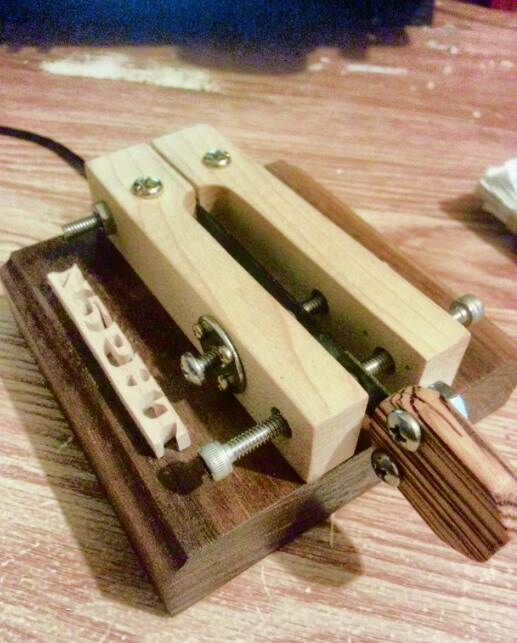 I have one made by Hank Svard who worked at SAG radio on Goat Island (Gõteborg), it is made of angle brackets and a hacksaw blade, see my page on the ssn webpage. I also love the red feet. I uploaded new video showing Tony VK3CAB's side swiper in action here. Note that when trying to send "perfect Gerke code" I find the key needs to be slapped around a bit and from a distance... when adding in swing, it is more relaxed. I'm new of course, so technique may improve in future. I'm still not sure I use a bug correctly either as I think I treat it similar to a paddle, coming from decades of iambic paddle use. Thanks so much for your enthusiastic participation dear Jos. With this button magnets/soft contacts assembly you can add nice sprung contacts to any cootie key, no drilling/soldering required. are not that springy and can produce scratchy CW (mine does). 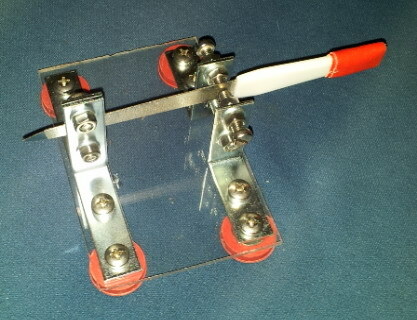 With the use of a number of button magnets and small strips of .005” (.0015mm I think) shim steel, feeler gauge etc as in the photograph this scratchiness can be eliminated. The arm of the KDM is non magnetic but the attraction of these neodymium magnets is strong enough to do the job. Easy, cheap and neat, congratulations Martin!